← Pumpkin Chicken Noodle Soup; P.C. or not? 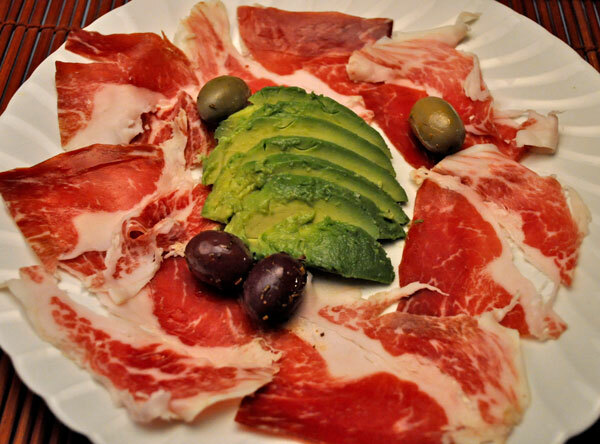 When we first started spending time in Spain I ordered a starter of their famed Jamón Iberico de Bellota. As you can see there is a bit of fat…. 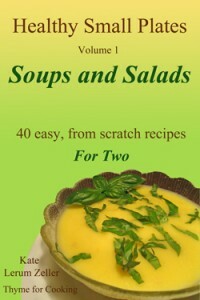 I proceeded to eat it normally, for me, which was carefully trimming the fat and setting it aside. The very proper Spanish waiter came over, leaned down and whispered in my ear: Señora, en España we eat the white. This presented me with a bit of a dilemma…. I wanted to eat it the right way but I didn’t want to eat the little pile of fat on the side of my plate. I compromised…. I quit trimming and started eating – to the approval of the waiter who was watching me from the side of the room. One should eat the white. 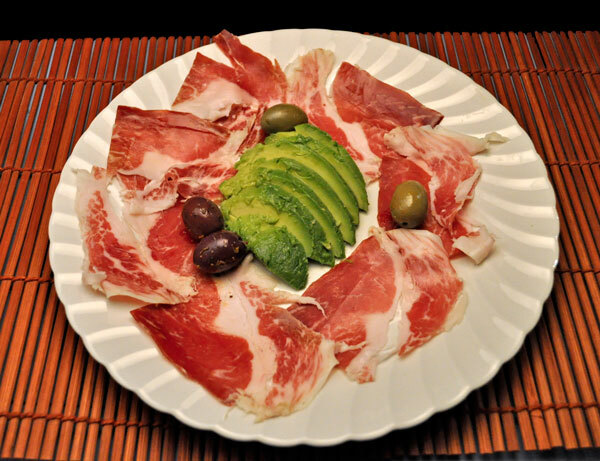 It holds a lot of the flavor of the ham and, according to some studies, is actually a healthy fat that is good for us. Unlike many fats (butter, for one) the fat on an acorn-fed Iberian ham is not hard at room temperature (it’s not liquid, but it’s soft). A few weeks ago I got an email from Ibeham Project asking me if I would like to sample some of their ham. Personally, I think Spanish Iberian ham is the best. I prefer it to both French and Italian hams. 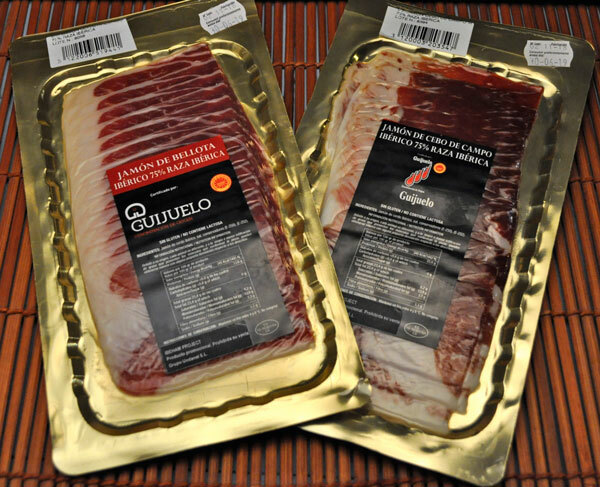 A week later I received two packages of ham in the mail from Guijuelo, which is in the Salamanca region of Spain. One was Jamón de Bellota and the other was Jamón de Cebo de Capo. The difference between the two hams is in what the pigs eat – in simple terms Bellota ham comes from pigs that have primarily eaten acorns and the other from pigs that are primarily pasture fed. Both are free-range. The curing and hanging process takes from two to five years. These wonderful hams cannot be rushed. There is a short, but very informative video all about it on the Ibeham Project site. 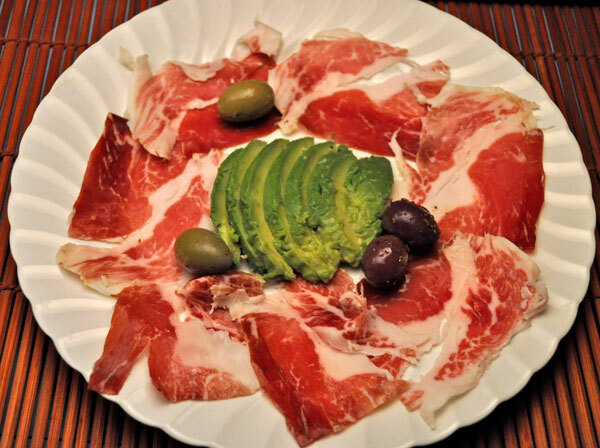 Jamón has been produced in the Guijuelo region since the Middle Ages. Situated 1000 meters above sea level it is the highest of the ham-producing regions. Because of the climate less salt is used but a longer curing period is required, giving the Jamón from Guijuelo a characteristic flavor. Thank you to the people at the Ibeham Project for sending me this wonderful ham. We had the perfect wine to go with it: Pirineos Blanco from the Somotano regions of Spain. I also think Spain makes the best white wines…. Yum….I would have been in 2 minds over the white….good on that waiter !! Next time you’re in Spain…. My one regret from when we sailed from Spain back to the St Marteen was we did not buy one of those legs to eat on the trip back home.